In May 2010, Human Rights Watch took leading portrait photographer Platon to the Thai-Burmese border to photograph former political prisoners, civil society leaders, ethnic minority group members, journalists and other people in exile from their country, Burma. 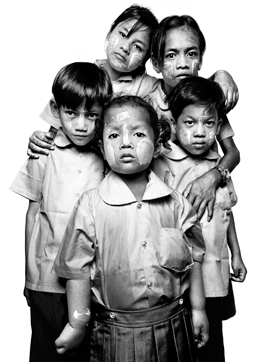 All of those in this portrait portfolio have experienced human rights abuses in Burma and sought refuge in Thailand. Instead of being demoralized and defeated, they have united and use their shared experiences to educate and work for a better future for all of Burma’s people. Although forced into exile, they have not been silenced. As a former political prisoner and co-founder of the Assistance Association for Political Prisoners, Bo Kyi works tirelessly to secure the release of more than 2,100 Burmese citizens who have been jailed for their political independence and activism. After taking part in peaceful demonstrations during Burma’s 1988 popular uprising, Bo Kyi was arrested in March 1990 as a college student for joining the human rights cause. He ultimately spent seven years and three months in prison, suffering interrogations, beatings, shackling and torture amid squalid living conditions. Throughout his long ordeal, Bo Kyi resolved that he would work for the release of all those who remained unjustly held in Burma’s prison network. On release, Bo Kyi escaped to Thailand where he helped found the Assistance Association for Political Prisoners, pressing for the release of those still in prison and providing health services, guidance and care for them and their families. Shirley Seng, 63, Mary Labang, 36, and Nan Pyung, 21, are members of the Kachin Women’s Association Thailand in Chiang Mai. 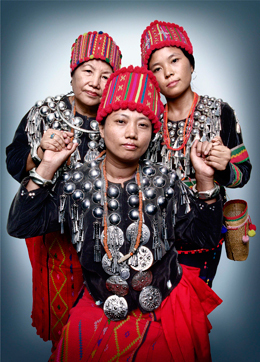 They speak out against the multiple forms of violence in Burma that result in the displacement, trafficking and migration of indigenous Kachin women, as well as women belonging to other ethnic minorities such as the Karen, Lahu and Shan. 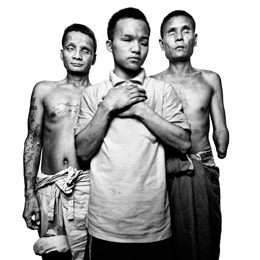 Three landmine victims: Kio Say, 43, Hsa Ka Twe, 15;, aPar Taw, 45. Burma is one of the top remaining users of landmines as part of long-running armed conflicts between government forces and ethnic minority groups. According to the 2010 Landmine Monitor, Burma is the only country that continues to use landmines on an ongoing basis, having failed to sign the global anti-landmine treaty. The Burmese army routinely deploys landmines near borders with Thailand, Bangladesh and India, as well as in Burmese states with ethnic minorities such as Karen state and Shan state. Victims and dissidents are not statistics and "faceless." Deeply, deeply moving. Impressive and powerful. I have circulated this worldwide.